Yet another one of Peter Martinez' good ideas are scattergrams. Making use of STANAG transmissions on the HF band we can do real-time ionospheric sounding in a manner which shows Doppler and delay effects simultaneously. The display shows frequency shift on the horizontal axis and time delay on the vertical axis. The horizontal span is 9.2Hz and the vertical span is 12ms. Click here to hear a STANAG transmission. The blobs in the middle are ionospheric returns here seen on 4.787MHz at around 1630z. The vertical lines are not "real". Here is another scattergram, this time done at 6MHz showing the o and x waves separated horizontally (in frequency) with one two and three hops visible (ok I know that you do need a vivid imagination to see all this stuff!). The scattergram above is done at 8MHz and shows a lot of time dispersion (horizontal spread) probably a backscatter component. This nice example done by Paul Widger on 8MHz shows the groundwave (small dot in the middle) together with a reflected return slightly higher in frequency with some temporal dispersion and a wider band (or bands) of backscatter above. The horizontal line to the right of centre is a return from an aircraft. 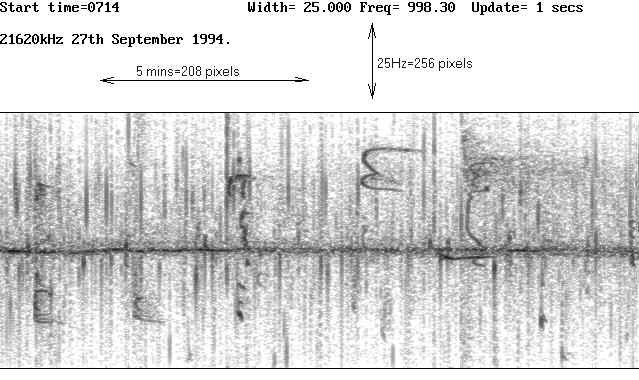 On a good day one sees mysterious things like this seen on 4.5MHz at 1645z. Explanations on a postcard to the usual address. These things certainly test the grey matter. The STANAG signals can be used to detect Doppler returns from aircraft. This display was done using a STANAG transmitter on 16MHz during the night. The upper display is a scattergram and the vertical line is a return from the groundwave (smeared in time). The lower display shows the groundwave (horizontal line) with multiple aircraft returns (the near vertical curves). The aircraft can be observed on the scattergram as "blobs" that pass from right to left (HF to LF). 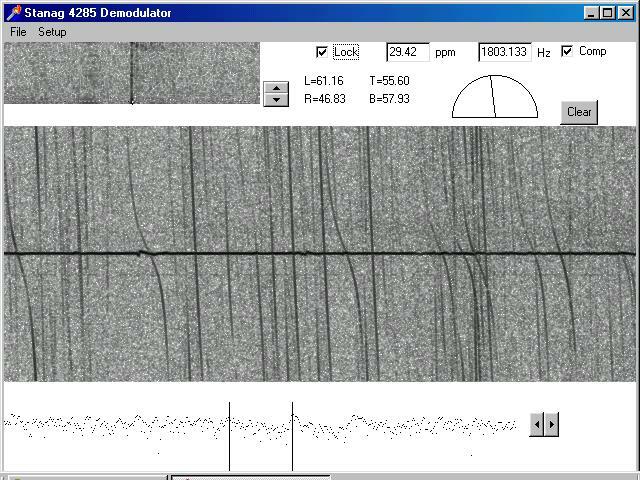 These strange curves are meteor returns recorded using the STANAG technique at 8MHz. Here the display is a Dopplergram with a vertical axis of frequency and a horizontal one of time. The odd shaped curves rare caused as the ionised meteor trail passes through zones of windshear. Interestingly the noise-like STANAG signal makes it very easy to hear these meteor effects by ear. Again at 8MHz this Dopplergram shows numerous meteor pings (short vertical lines). This was done at dawn when the optimum meteor rates occur. This ping was hugely strong causing a dramatic enhancement of the STANAG signal at 16MHz where it was only just audible by groundwave. This trace by Peter G3PLX shows meteor returns at sunrise using a convetional Doppler technique. The "C" shaped form is clearly visible.